If you feel like the quality of your sleep has changed as you’ve gotten older, you aren’t wrong. Sleep does indeed change as we age. We’re most familiar with age-related sleep changes in context with kids. How much sleep they need changes rapidly during childhood as they grow and develop. But sleep changes don’t end at adolescence. Here are four facts on adults and sleep. How much sleep you need varies somewhat from person to person. The National Sleep Foundation (NSF) released a new set of sleep guidelines last year. In those guidelines, they list suggested hours of sleep for most adults, but also identify potential (and normal) outliers. For adults ages 18 to 25, most need between seven and nine hours of quality sleep per night. However, some adults may need as few as six or as many as 11. For adults ages 26 to 64, most need between seven and nine hours of sleep per night. But some adults may need as few as six, and some may need as many as 10. For adults ages 65+, most need between seven and eight hours of sleep per night. Some adults, though, may need as few as five or as many as nine. How can you know how much sleep your body needs? Over a weekend, don’t set an alarm clock and simply see when you wake up. How many hours of sleep did you get? Adjust your bedtime to allow for that amount of sleep on days you have to get up at a certain time. Sleep architecture changes as we age. The term refers to patterns in our sleep related to REM and non-REM sleep. During a night’s sleep, the cycle between REM and non-REM sleep repeats several times. According to the NSF, older Americans report that it takes them longer to fall asleep, they experience less REM sleep (periods of dreaming), and they experience an increase in fragmented sleep (waking during the night). This often leads to them feeling less satisfied with sleep and more fatigued during the course of the day. In addition to sleep architecture changes, a person’s circadian rhythms also change. Circadian rhythms coordinate bodily functions, including sleep. Older adults tend to get sleepy earlier in the evening and wake earlier in the morning — a phenomenon called advanced sleep phase syndrome. Sleep disturbances become more common. Not only are insomnia and other sleep disorders more prevalent, but older adults also experience disturbed sleep caused by medications and medical conditions. When it comes to insomnia, nearly 50 percent of seniors experience insomnia at least once a week. If you experience insomnia, talk with your doctor. He or she can assess its severity and how to help curb the issue. That may involve changing lifestyle habits, such as cutting back on caffeine or naps; behavioral therapies; or prescription medications. Snoring disrupts the sleep of around 90 million American adults. 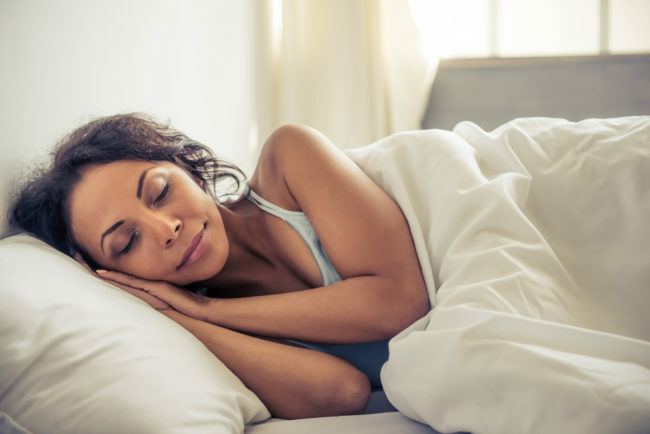 Severe, loud snoring can be a symptom of obstructive sleep apnea, where a person stops breathing for up to one minute at a time while sleeping. You may have heard of restless legs syndrome, but periodic limb movement disorder is also common among older adults — with up to 45 percent experiencing at least mild PLMD. And beyond sleep disorders, conditions such as GERD, asthma, Parkinson’s disease and multiple sclerosis can all cause difficulty sleeping. Good sleep “hygiene” is essential. But what on earth is sleep hygiene? Sleep hygiene refers to a set of practices that promote good sleep. Stop drinking caffeine and alcohol several hours before bedtime. Get regular exercise, but avoid vigorous exercise too close to bedtime. Make sure you’re exposed to natural light during the daytime. Establish a relaxing bedtime routine — and stick to it. Having difficulty sleeping? The Sleep Disorders Center at Erlanger North offers diagnosis and treatment for sleep issues. Call (423) 778-3316 for more information. Exercise for kids: Are your kids getting enough?